Sicme Motori processes the windings of electrical motors in a receiver of 23 m3 volume. To guarantee the leak-free operation of the receiver, a gasket filled with compressed air is used. 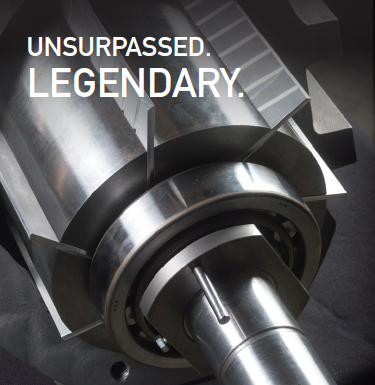 The customer sets the target of minor evacuation time in order to achieve higher productivity. The collaboration of Sicme Motori with Pneumofore goes back to 1986, when the first UP6 rotary vane air compressor was installed. In 2005, the vacuum application was analyzed as well and a large potential for improvement was identified mainly in terms of pump down speed. The previous rotary vane pump did not satisfy the requirement of achieving 6 mbar(a) within the shortest possible time. This was not a surprise due to the pumps’ size and the systems set up being single-stage only. 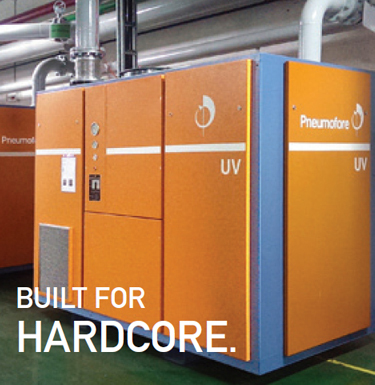 The solution provided by Pneumofore consists of a UV8 as backing pump and one roots blower starting at 70 mbar(a). Before the roots blower lies a generously dimensioned pre-filter. After several weeks of testing and fine tuning, the customer found the Pneumofore solution to be very fitting. The absolute pressure of 3 mbar(a) is achieved in the 23 m3 receiver within a fraction of the time required earlier. At this pressure level, within this process, the resin used for the impregnation turns into foam and is distributed with constant thickness and on the entire required surface . 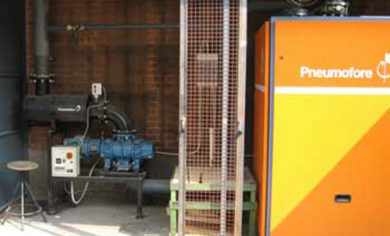 The picture shows the UV pump and the roots blower installed in series. 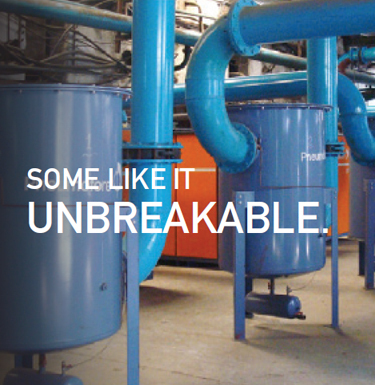 Pneumofore did calculate and design the system layout as an integral engineering service for the customer. 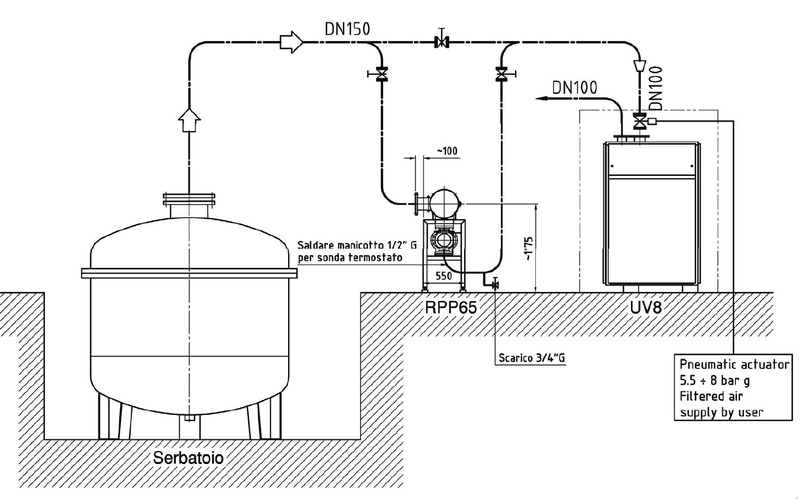 The installation drawing explains the system set up in its major components. 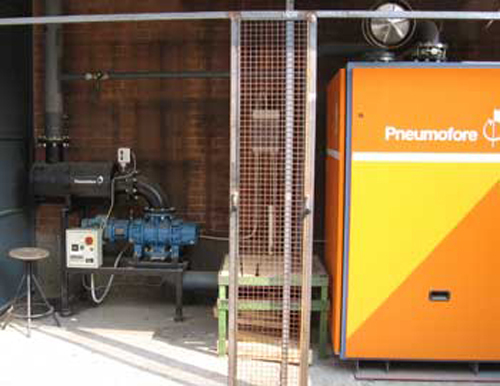 The sturdy construction of the delivered machines as well as the accessibility and ease of maintenance motivates the customer to execute all ordinary maintenances without any service support from Pneumofore.